In Dutch oven, place eggs in single layer; carefully add enough cold water to cover eggs by about 1 inch. Cover; heat to boiling. Remove from heat; let stand 15 minutes. Drain. Immediately place eggs in cold water with ice cubes or run cold water over eggs until completely cooled. To remove shell, crackle it by tapping gently all over; roll between hands to loosen. Peel, starting at large end. Cut eggs in half lengthwise. Carefully remove egg yolks to medium bowl; place egg white halves on serving platter. Mash yolks with fork; stir in mayonnaise, 1 tablespoon of the chives, the cocktail sauce, salt and pepper until well blended. Using decorating bag fitted with open star tip, carefully pipe yolk mixture into each egg white half. Cover; refrigerate at least 30 minutes to blend flavors. 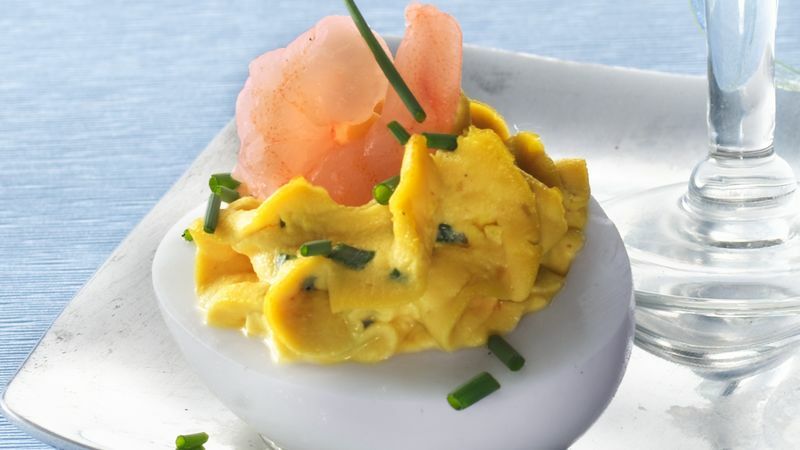 Before serving, garnish eggs with shrimp; sprinkle with remaining 2 tablespoons chives. For easy prep, look for a squeeze bottle of cocktail sauce at your local grocery store. Garnish with additional cocktail sauce, if desired.